Needleturn is a traditional type of applique where patches of fabric are sewn to a background fabric while a hand sewing needle is used to turn under the seam allowance as you sew. Search the internet for definitions of the word applique and you'll find lots of similar, but slightly different, meanings. For quilters, applique refers to sewing one or more shapes to a larger piece of fabric, the background. There are many ways to applique by hand and by machine, and you'll find there are lots of assembly variations within each of those two categories. 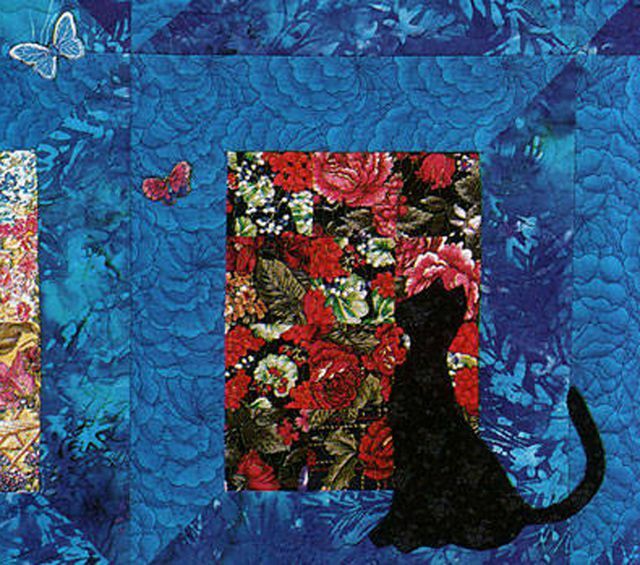 Quilters usually discover a favorite applique technique as they experiment with different methods. It's nice to be proficient in as many variations as possible because you never know when the skill might come in handy. Shapes are traced onto fabric and cut out, leaving a seam allowance of about 3/16" to 1/4" around the traced line. You can adjust the width as you discover what works best for you in different situations. Seam allowances are turned under as shapes are hand sewn to the background. Ideally, stitches are invisible, but don't let that discourage you from trying needleturn applique. Have you hand sewn a binding to the back of a quilt? Yes? Then you've already practiced the art of making your stitches disappear. You'll discover your own favorite tools as you learn to applique, but let's go over a few tool suggestions to get you started. Use fine cotton thread that matches or blends with the appliqué patches in your project. Sharps are long, thin needles that are perfect for applique work. Other good choices are straw and milliner's needles. Use a size that feels comfortable in your hand. You do not need special scissors to get started but may quilters find they are a good investment when applique becomes a favorite technique. One type of scissors has sharp blades that cut all the way to their tips. They're perfect for making precise trims and cutting into areas that might need a bit of coaxing to turn under neatly. Another type of applique scissors has a paddle blade on one side that resembles a duck bill. As you trim edges, the paddle pushes the seam allowance out of the way to keep you from cutting too close to the fold line. Purchase enough fabric to cut oversized background pieces because backgrounds become distorted as you work. Add about 1" to the unfinished size of a block size to begin with -- more if your project is complex or blocks are large. Don't skimp -- you sure don't want to end up with a block that can't be squared up to the correct, unfinished size after applique is added. Most patterns offer suggestions. You must usually make rigid templates of pattern shapes. Template plastic is durable, but you can make templates from something as simple as an empty cardboard box from the pantry. Short applique pins are handy for securing motifs to the background and they aren't likely to poke your fingers as you work. Concave curves: In general, it's often easier to turn under a concave curve (a curve that moves inward, like a bite out of a cookie) if you make perpendicular cuts towards the folded seam allowance. Convex curves: Convex curves bend outwards, like a rounded hill. There's usually no need to make clips into a convex curve. Outward points, like star tips: Sharp points can become bulky from multiple layers of fabric created when raw edges are turned under for sewing. Minimize bulk by (temporarily) ending your seam a couple of stitches before you reach the end of the pointed tip, and trimming away a portion of the remaining seam allowance along that side. Now cut off a portion of the seam allowance above the point itself (straight across) and fold what's left straight down, perpendicular to the point. Fold under the upper sections of the next side of the point and continue sewing. Use the tip of your needle (or a toothpick) to coax fabric into place if necessary. Inside points, the reverse of a pointed tip: Clip straight into inside points, almost to the seam allowance. Stop sewing a few stitches before you reach each inside point and turn under the seam allowance on both sides. Continue sewing, taking a few extra "security" stitches into the pointed area where the seam allowance was clipped. The truth is, you'll need to practice working with curves and points. Cut some motifs and backgrounds from leftover fabrics and experiment until you're comfortable with folding and sewing. Applique shapes do not include a seam allowance. You'll add that later. Create a template for each shape in your project. If using see-through plastic, you can place the plastic over the pattern and trace the image. Another option is to photocopy (or scan) the images at 100% and glue them to template material (or use double=stick tape), then cut out on the lines. Position a template right side up on the right side of your fabric and trace around its edges. Turn the template over to trace mirror-image shapes. Draw and cut shapes as you go, leaving a 3/16"-1/4" seam allowance, or draw all shapes side by side (leaving enough space for two seam allowances) and cut out. If you're new to applique, I recommend only cutting what you need for one block, in case you must adjust seam allowances to suit your sewing style. Cut a piece of background fabric, adding 1" to the unfinished unit's width and length (less for small blocks with a simple shape or two; more for large, complex blocks). Fold the background in half from top to bottom and finger crease. Unfold and fold again from side to side. Finger crease. Unfold. Fold along each diagonal, making finger creases each time. The fold lines will help you arrange your patch(es) in the background. For intricate blocks, trace the finished layout on top of the fabric to use as a placement guide. Use fine lead, placing lines slightly inward from the target spot for fabric motifs, or trace with one of the many disappearing ink pens on the market (read pen instructions carefully). Pin or baste motifs to the block, starting with the bottom layer. You don't need to applique edges that are covered by other shapes (but I like to tack them down). You can pin all of the shapes to the block now, or work in layers from the back forwards (my favorite). Thread a thin needle with about 20" of matching cotton thread. Make a knot at one end of the thread (applique stitches are made with one strand). Starting with a shape in the bottom layer, bring the needle up through the back of the quilt block, its tip emerging a tiny bit to the inside of the marked fold line of the motif. Use the tip of the needle to fold under the seam allowance at the spot where the needle emerged, taking care to hide the mark under the fold. Hold the fold in place with your fingers and insert the needle back into the fabric, right next to the place where it emerged. Keep moving, bringing the needle back up and catching a couple of threads on the now-folded seam allowance ahead of the first stitch. Tug the thread slightly to make your stitches disappear into the background and edge of the motif. Continue folding and sewing your way all around the shape. When you reach the end, take the needle through the background and make a small stitch, leaving a loop. Thread the needle through the loop and pull to create a knot. Clip excess thread. Applique remaining motifs to the background, working forwards in the design. Option: When the block is complete, some quilters like to cut away excess fabric, leaving only the top layer and a 1/2" (or so) rim of fabric around the shapes on the reverse side of the block. Take care not to cut through the top layer of your block. Press the block carefully. Trim the block to its unfinished dimensions, centering the applique (or as directed in your pattern). There are many additional methods that can be used to hand applique -- traditional needleturn is simply one choice.